Beloved Emcee and costume goddess Cora Vette, owner of Denver’s one stop burlesque shop VaVa Vette, gives us the 411 on creating a custom G-string. 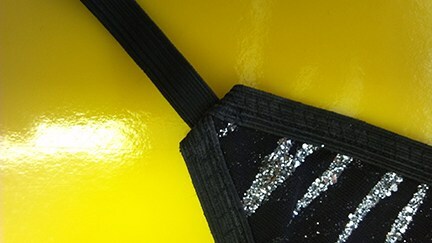 Don’t you sometimes wish that you could find that perfect G-string to match your burlesque costume? Did you shop everywhere and then settle for one that was only ok? This month I am going to show you how to make a simple G-string that is exactly what you need. Step 1 – Select your material. Your G-string needs to be made of a material that has some stretch to it. I prefer 2-way stretch (meaning it stretches both up and down, and side to side). But, you can also use one that only stretches in one direction. Just make sure that, when you lay out your pattern on the material, the stretch goes up and down not side to side. Also, if you are using a 1-way stretch, (as I was for this tutorial) cut your triangle piece a little wider to make sure you have adequate coverage since it will not stretch widthwise. For this demonstration I used 2 different fabrics. I wanted the glitter fabric for the g-string, but the fabric was see-through, so I used another layer of opaque fabric as well. Step 2 – Make a paper triangle piece the size you need. Find a G-string that you have that fits well and make a triangle roughly the same size. This may take some trial and error as we are all built differently, that’s what the paper is for. Keep experimenting until you get the size that is perfect for you. The pattern I used for this demonstration was 7.25″x9″ – but you can make one any size you need. Step 5 – Pin the side elastic at the top and bottom with the elastic on the top and the fabric under the elastic, then stretch it out so you can see where the middle of the elastic would be at the side of your triangle and then put another pin in the middle. Step 7 – Sew the back elastic to the bottom point of the triangle. I think it is looks nicer to place the elastic on the right side of the triangle and sew, so that when you turn it under there is a nice clean seam. (pic 7 Yes…I am considering a career as a hand model) It really doesn’t matter how you sew it because this seam will be unseen, but, as you may have figured out, I am a crazy person for small details. However you choose sew it, just make sure that it is connected to the bottom point of your triangle. 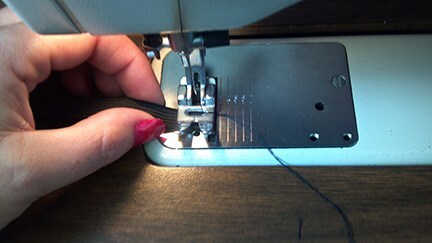 Step 8 – Sew the ends of the waistband band elastic together. 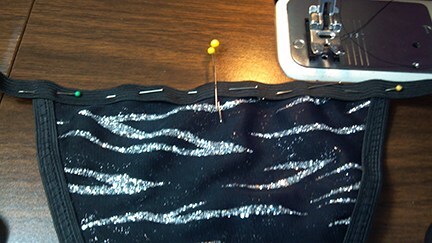 Step 9 – Sew the free end of the back elastic to the seam of the waistband on the inside of the elastic. 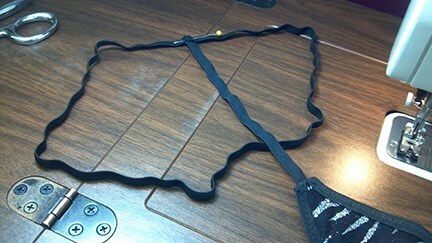 Step 10 – Fold the elastic waistband in half to determine where the front center is and place a pin at this location. Then, fold the top of the triangle in half to find the center of this piece. Mark this location with a pin as well. 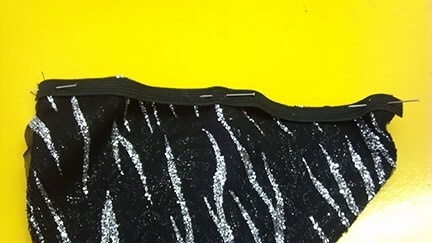 (pic 11) Placing the elastic waistband on TOP of the triangle fabric, match the 2 pins and, with another pin, pin the elastic to the top of the triangle. Imagine this bad boy in action! 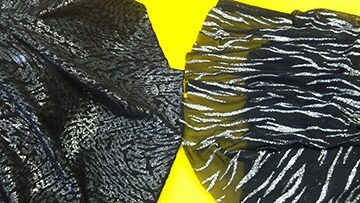 Check out my other creations at www.vavavette.com.